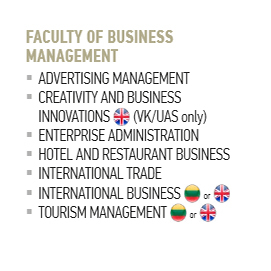 If you seek business education that is innovation-driven, creativity-inspired, practice-oriented and personally transforming – one that will prepare you for your creatively re-defined future and success – then welcome to the Faculty of Business Management at Vilniaus Kolegija / University of Applied Sciences. Our Faculty encourages a unique approach towards studies, where students have the opportunity to experience our creative learning environment, gain real-world business experience and forward their entrepreneurial ideas. 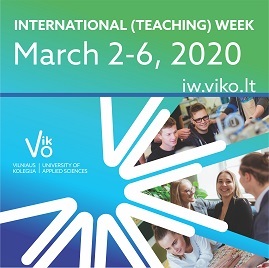 Close collaboration and partnerships with Lithuanian and international businesses and organizations ensure that our students gain the most up-to-date knowledge and international experience that are essential for today’s employability and successful career prospects. The Faculty of Business Management strives to serve as a creativity-driven platform for business professionals and future entrepreneurs, since innovation, creativity and entrepreneurship clearly constitutes the key issues for contemporary business studies and advanced business careers. The Faculty strives to empower its students and the teaching faculty to promote creative thinking, take initiative in entrepreneurial ventures, and to continuously include new innovative approaches into the teaching process. The Faculty does its best to teach students to identify and convert market opportunities into workable, marketable, profitable and sustainable ideas and business achievements. Study process that is modern and corresponding to the requirements of the European Higher Education, to effectively cooperate with people engaged in activities; develop general skills and civic awareness of students needed for the graduates working and continuing studies. Education insitutions form over 30 countries. VK was awarded the Diploma Supplement Label by European Commission in 2010. The Quality assurance system based on ESG – Standards and Guidelines for Quality Assurance in the European Higher Education Area is implemented in VK.